Old Street Station, at rush hour on a weeknight, is not the most pleasant place to be. A steady flow of passengers, grumpy from their days at work and desperate to get onto the tube and home to their families pushes through the narrow concourse, queues interminably for the one Oyster top-up machine (where a clueless tourist is inspiring the wrath of the 20 people behind him while trying to decide if they’re still in Zone 1) and grumbles collectively at the cheek the other travelers are showing just by being alive at this moment. 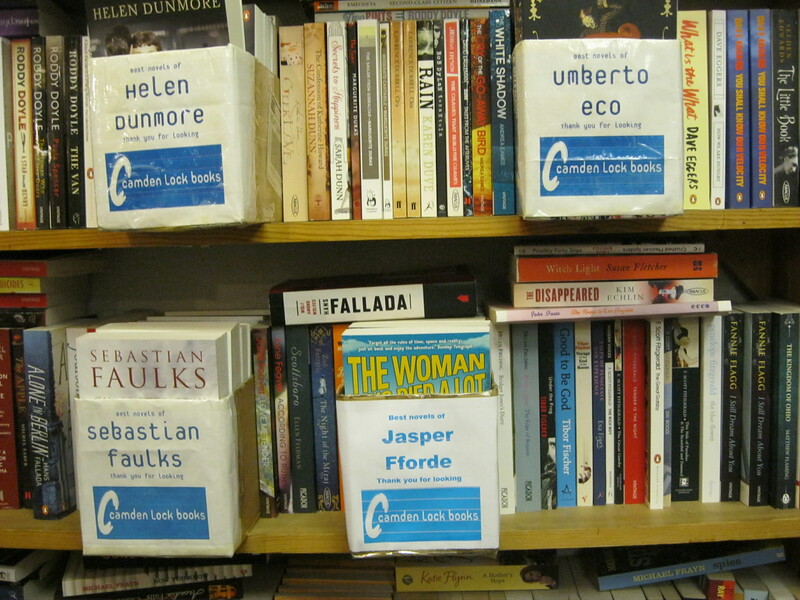 And perhaps that’s why the world needs Camden Lock Books in the midst of all of it. When you push the door open and enter this small underground shop, the world goes quiet, like when you jump into a lake and all the noise around you immediately hushes as you hit the water. One of my favourite things about bookshops is the way they smell, but I find I usually have to sniff around the books themselves to get my fix. 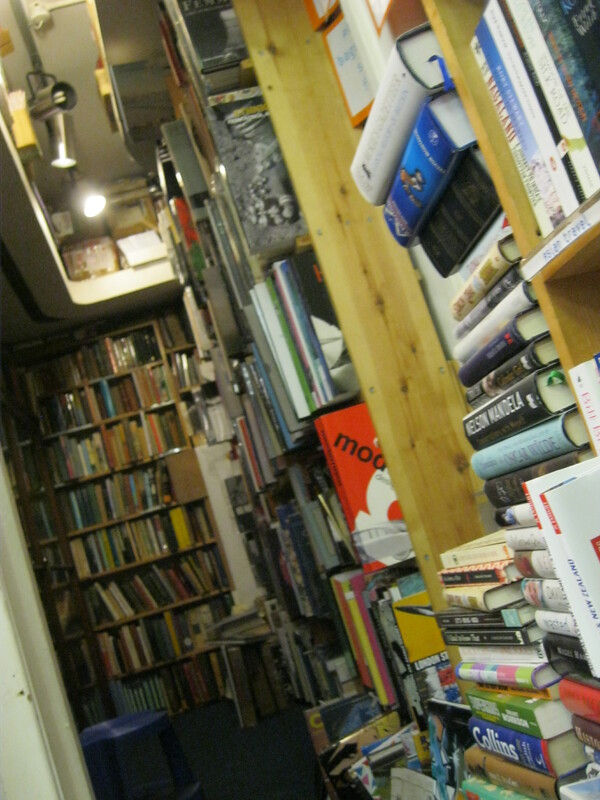 In this bookshop, though, it’s as if that smell exudes from the very walls of the place. I don’t think I’ve ever walked into a room that smells quite so good. 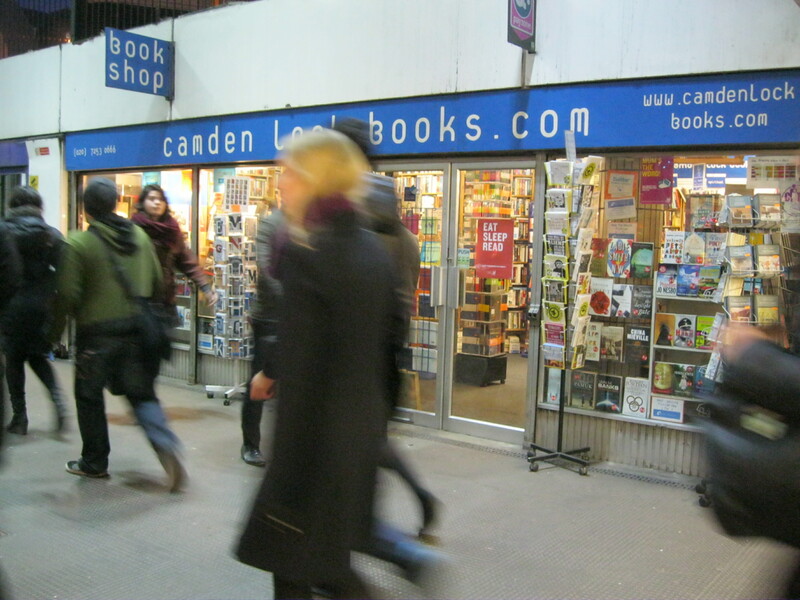 The location of this shop is strange, considering it’s not only underground in the tube, but also bears the name Camden Lock Books, despite being miles away from Camden Lock. On the bookshop’s website, the owner describes how the shop used to be located in Camden and in a few other locations across London before moving to Old Street. The explanation of its name seems a bit apologetic, but I think it needn’t be – the anomalous lost-ness of this shop is nothing but charming. Speaking of the shop’s online presence, their twitter feed is hilarious; someone there seriously hates Amazon. I approve. 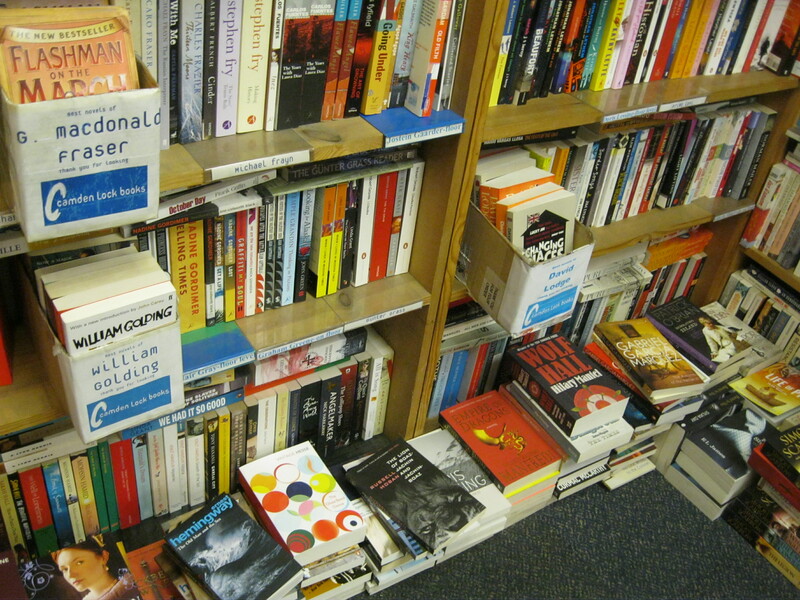 The Fiction section, my first port of call in any bookshop, is admirably well-stocked. The books cover all the walls and slither down onto the floor as well, waiting, still perfectly alphabetised, for a browser who doesn’t mind looking like a toddler by slumping down on the floor. But Camden Lock Books has also made an innovation to the conventional bookshelves which I think is absolutely brilliant; hanging off different sections of the shelf are little cardboard boxes which have in them a few of the classic, or best, novels by the author whose place on the shelf they occupy. For example, when the alphabet marches on towards E, there is a box full of ‘The Best Novels of Umberto Eco.’ I adore this system because it makes good literature so accessible. With a writer as prolific as, say Eco, or Margaret Atwood, who also has a box, it’s hard to know where to start and when a j udgmental bookseller or fellow customer is looking over your shoulder (I’m definitely guilty of spying on other browsers) it can be so intimidating trying to make your way through a writer’s oeuvre that you just give up. But this box idea is fantastic because no matter which book you pick, you can trust that it has been put there because it is a classic or a good place to start or particularly indicative of a writer’s style. It’s an idea I’ll store at the back of my mind for the day I have my own bookshop. The collection of novels is a good balance between classics and contemporary fiction, with all the books in perfect condition. 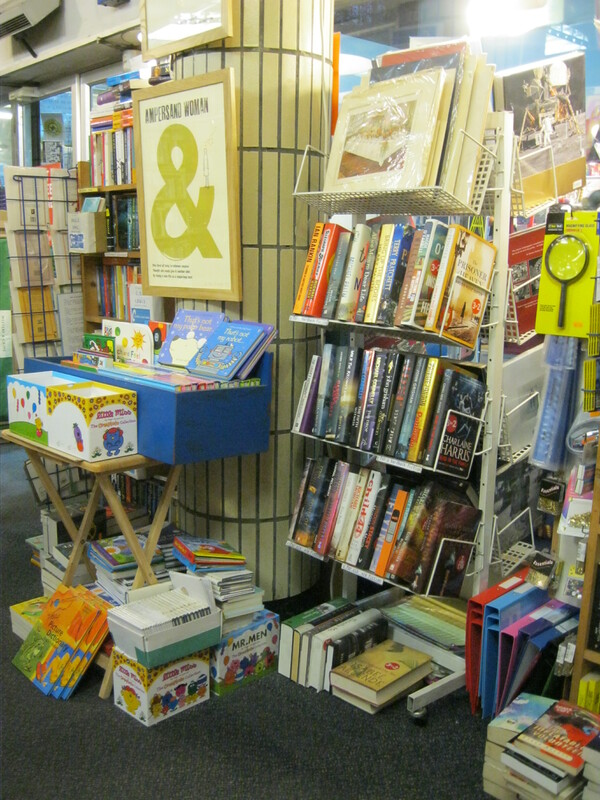 Most of the new books are retail price, but in the centre of the shop there is a big table of books on sale. It was there that I bought today’s purchases, a good-as-new (if not new) copy of D.H. Lawrence’s Sons and Lovers for £2.99. I never can decide how I feel about Lawrence; every time I read something of his I go through a series of flip-flops, alternatively hating his guts and wanting to throw myself at his feet and worship. While someone like, for example, Ezra Pound is a love him or hate him kind of guy, I feel like Lawrence is of the love him and hate him variety. But I digress. In the back corner of the shop there is a small passage into a quiet little back room where art, fashion and architecture books live. The room is the size of a large closet and covered from floor to ceiling in books and, since it’s hidden in the corner, it affords a quiet place to hide from the humans and be alone with beautiful books. 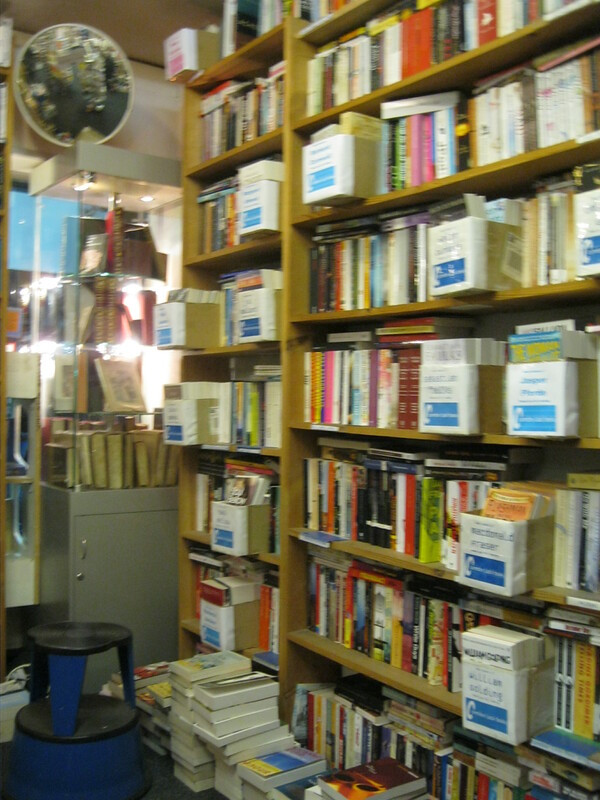 The rest of the shop’s shelves are filled with other treasures: cook books, humour and comics, books about religion, philosophy and psychology, politics and economics and a good selection of history books. There is a music section with music biographies, theory and music books. I was excited to spot a Best of Joni Mitchell music book which was for the guitar, an instrument I would love to but unfortunately don’t currently know how to play, but I still pulled it out and fondled it for a minute before accepting defeat. A biography section was well-stocked as well, with literary, historical and political biographies. Being in this bookshop today got me thinking. I grew up with three younger brothers, who loved sports, rough-housing and yelling. That description is slightly unfair to their adult selves; all three are clever, interesting and insightful people now that they’re grown up a bit, but as children, I couldn’t help thinking of them as cretins whose only reason for being was to disrupt my peace and quiet. When their little boy games became too much and there was nowhere to go to be alone, books gave me another place, one that no one else could access. While the noise raged on all around me, I could completely tune it out and find myself in a place where I was alone and where no one bothered me. For the many millions of young misfits who grew up with books as their refuge, the world inside the pages was one where they could be bigger, stronger, braver or cooler. For me it was all these things – a place of adventure, discovery and excitement – but also and perhaps most of all, a place of peace, a stronghold against the loud brutality of the outside world. Walking into Camden Lock Books reminded me of what it was that books always meant to me growing up. No matter how chaotic, crazy, brutal or unforgiving the outside gets, there is a placid place in all of us and books help us get there. While the majority of people rushed past the shop without even glancing in, a handful stopped to have a break from the manic of the tube at rush-hour. A few of them seemed to be regulars, which is not surprising because if I had to battle my way through the station every day I would probably develop a habit of retreating into this one quite, sane place as often as possible. Some customers chatted quietly, but most got right to browsing, making no noise louder than the soft instrumental music, the turning of pages, the creaking of floor boards and the quiet conversation between the two employees about Alfred Jarry. There is no question in my mind as to which side of the door is the place to be. This entry was posted in London and tagged Amazon, bargain books, book-hunting, books, bookshop, bookshops, bookstore, bookstores, camden lock, Camden Lock Books, Central London, cheap books, D.H. Lawrence, East London, EC1, I Hate Amazon, I hate Kindle, independent bookshop, independent bookshops, independent bookstores, Joni Mitchell, kindle, literature, London, London bookshops, Old Street, Old Street Station, reading, Umberto Eco, underground shop. Bookmark the permalink. I have 3 younger brothers too (and a sister). Gowing up we called ourselves “the constant noise machine.” Having quiet space to read is a real luxury. This shop is an oasis. I usually make time to go to this shop whenever I go to Central London. It is as if books I like are in front of me. It is worse if my children comes as well; they just have to buy something from there! My kind of bookshop! Not on my usual routes when I visit London but definitely worth a detour next time. I love your descriptions and photos, it almost allows me to feel I’ve been there. Thanks! Just delightful, as usual. Love your descriptions of the brothers. Many people just read books from the outside and don’t escape into the book and leave the world behind. Can I just say for a moment how much I love this blog? I come from South Africa and we don’t even have enough different kinds of bookshops to justify a blog like this, so reading your descriptions of all these amazing places is like an oasis in itself. Oh, yes, another one to add to my Next Time I Am In London List…..In the meantime I will just have to enjoy your evocative description. The idea of the box of authors is an excellent idea. So many bookshops I am never gonna visit. This is torture!! 🙂 Great Blog! Wonderful! As an American stuck in Barnes and Noble megastore land, this is bliss! I recently re-read “84, Charing Cross Road” by Helene Hanff. She wrote of the Marks and Co bookstore at the title’s London address. Is it still there? Hey, glad you enjoyed it! There was a bookshop on the site of 84 Charing Cross Road, the same one but under a different name (I think it was called ‘Bookends’ but I’m not sure) until a couple of years ago. It closed down, but I don’t think it went out of business; it seems like it was one of those happier stories where the owners retired instead of being forced out, which lets me sleep a little easier. I feel your pain about Barnes and Noble – I used to live in Canada and bookselling there is the same – big chains with little to no personality. They’re better than nothing though! Yet another intriquing and unique bookshop to explore. I was wondering what the childrens area had to offer. Are any of our multi-talented Canadian authors/illustrators represented? I so enjoy your postings, filled with warmth and so appealing to any booklovers. 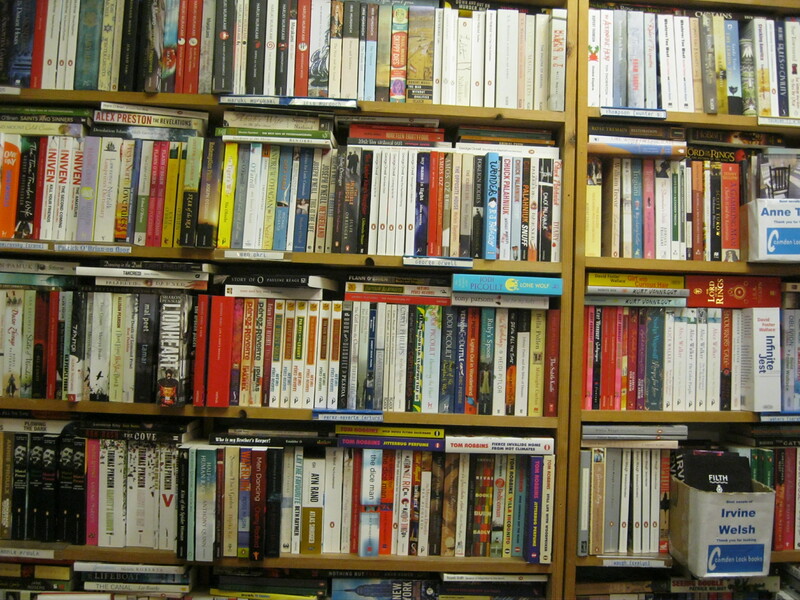 We do pay attention to the unique smells that a fine bookshop has to offer yet absent from ‘chains’. I used to work near Old Street and used to visit this shop occasionally. They had a particularly good range of off-the-wall postcards, some of which I’ve still got. 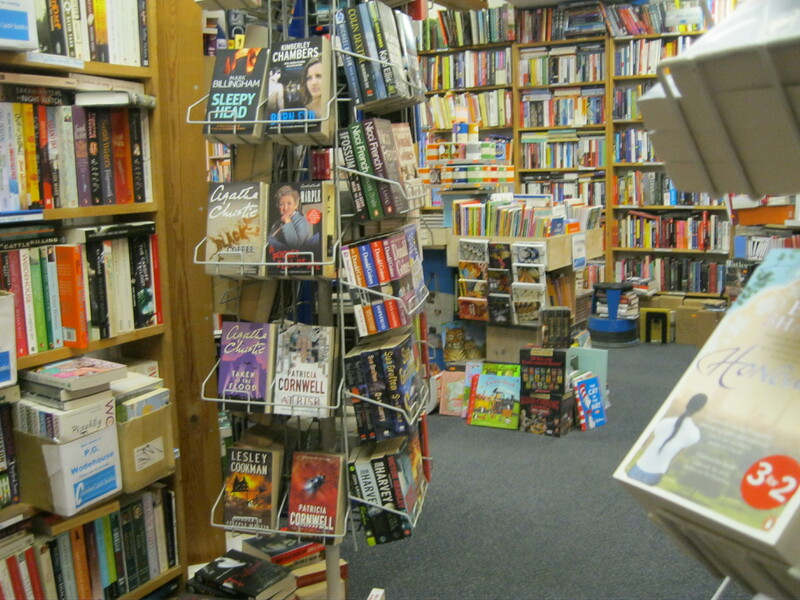 I ‘m thrilled to read your blog- you have described my bookshop in a way that would have been tough for me to do, because of my involvement in it: CLB is just too close to me to attempt to do it justice. It’s great to hear from you! I’m so glad you found the post and liked it. As you can tell I love your bookshop (and, let’s face it, bookshops generally) so thank you for doing what you do. I wrote this post a couple of months ago, so reading your comment on it refreshed my memory a bit. I haven’t been in in ages and might just have to pop in for a browse sometime soon. Best of luck with everything. Please keep doing what you do – it’s incredibly important to so many people.